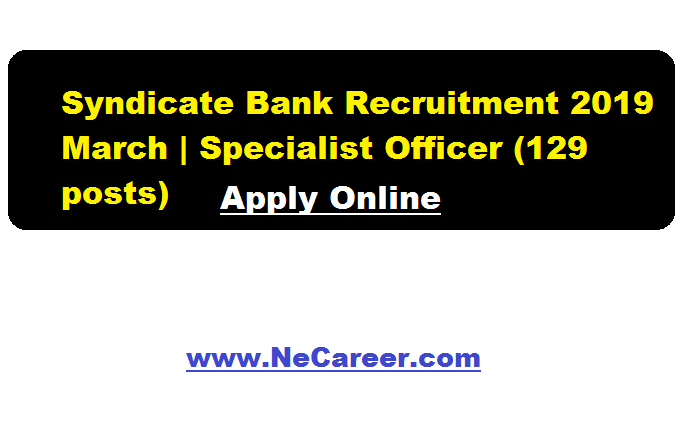 Syndicate Bank Recruitment 2019 March - Specialist Officer (129 posts) :- Welcome to North East India's No. 1 Job Portal NeCareer.com . Syndicate Bank has issued a job notification in March 2019. According to the recruitment, Syndicate Bank, Manipal (Karnataka) invites online application from young and bright graduates and who are interested in a Banking career for recruitment of various 129 Specialist Officer posts in various verticals/scales. Find more details in the following sections. Educational Qualification: Graduate with Mathematics or Statistics as a subject with full time MBA (Banking/Finance) or equivalent qualification from a reputed institute. Full time M.Sc. Mathematics or Statistics with min. 60% marks (55% for SC/ST/OBC/Pw0) OR CA/ICWA. Candidates who have acquired FRM/PRM/CFA/Diploma or certification in Risk Management will be given preference. Educational Qualification: An Officer with 05 years commissioned service in the Army/Navy/Air Force or a Police Officer not below the rank of ASP/DSP with 05 years of service or Officers of identical rank in Para Military Forces with 05 years service. Territorial Army Officers should have minimum 05 years of embodied service. Application Fee: Rs.600/- (Rs. 100/- for SC/ST/PWD) to be paid online. Bank reserves the right whether to conduct online test and/or GD/interview depending on the number of eligible candidates applying for the posts indicated. For the purpose of GO/interview, adequate number of eligible candidates as decided by the Bank will be shortlisted and will be called for GD / interview. Candidates possessing more than prescribed work experience in the relevant discipline and acquired relevant certifications shall get preference. Merely satisfying the eligibility norms do not entitle a candidate to be called for GD/Interview. Wherever online test Is conducted, candidates shall be called for GD and /or interview on the basis of their performance in the online test. i) GD/ personal interview shall be conducted to assess the candidate's personality. level of communication, clarity & problem solving innovativeness, level of efficiency, willingness to work in any part of the country, suitability for the post etc. The minimum qualifying marks in the interview would be 50% for General Category and 45% for SC/ST/PwBD category. Candidates not clearing the GD and / or interview will not be considered for final selection. ii) The post wise number of vacancies is provisional and may vary according to the actual requirement of the Bank. iii) If no suitable candidate is found for a particular post, the Bank reserves the right to cancel the process of recruitment for that post. Interested an eligible candidates may apply online at Syndicate Bank official website https://www.syndicatebank.in from 29/03/2019 to 18/04/2019 only.